Under What Conditions do PMOs Naturally Emerge? Like many posts I write, this one started as something somewhat tangentially related. Originally, this post was supposed to be a rousing survey of funding models for large transformational programs. Yes, I know….sounds exciting. As I started looking at the funding models currently utilized however, I realized that this story is not really one about funding models – but about how transformational programs are fundamentally structured, about the fundamental operating model or architecture of the transformation program. (“Structure” or “architecture” being shorthand for the combination of processes, tools and behavior required to support the transformation effort.) Hence, at some point during the writing, this post transmogrified from the original discussion of funding models to one on transformation program architecture. A step change program is one that is embarking on a specific goal over a relatively short time frame. Examples of this may be a regulatory remediation project, M&A activity, a divestiture, or an asset rationalization initiative. The main challenge, of course, in a large step change transformation program is preserving the value proposition of the original proposed change – and in maintaining the new target behavior once the formal program has concluded. After all, most large transformational programs are designed to permanently modify the underlying behavior of the organization. An incremental change program is one that occurs over a potentially much longer period and involves the gradual alignment of culture with the long term needs of the enterprise. Where the step change program is a “big bang” approach, the incremental change program is more of an evolutionary transformation conducted by tweaking the levers that guide project selection (among other things). Think of this approach as an implementation of formal governance processes followed by a gradual adjustment of those processes and the metrics that govern the organization to steer it in the right direction. Arguably, this approach is harder to implement due to the sheer number of moving parts – but it may also lead to more lasting change within the organization. (Which is another post). These two approaches could be mapped to a top-down vs. bottom-up model in terms of organizational change management. If we were to visualize these two models, it might something like the graphic below – albeit the incremental transformation is probably significantly slower to achieve the same level of lasting performance as the step change model. Each transformational program architecture includes a series of critical processes: standard program management blocking and tackling; project identification, prioritization and selection; funding, metrics and analytics, etc. Some of those processes may come naturally to the organization and some of those processes probably don’t. In fact, unless you work in an organization that is always transforming itself (which does exist) or in a consulting shop, it’s likely that you may not have the required skills to structure a transformation program. Anyways, suffice it to say, there’s almost always a series of new processes that must be defined to support any large scale transformation program. The focus on which processes to develop does change based on the specific architectural model applied to the program. In a step change transformation architecture, the focus will be on the traditional program management blocking and tackling. In this centralized structure, the desired end state is defined, split into multiple workstreams – and then each workstream is planned out and rolled up into a single Integrated Master Schedule (IMS). The program is then staffed with a program manager, IMS scheduler, workstream leads, and all of the other required staff. It sounds easy – but it still surprises me how few organizations manage to do this properly. (Pro tip: the more time you spend planning and structuring before just jumping into execution will be time well spent). Incremental transformations rely on a different model for driving lasting value. In this model, the transformation program piggy backs off of existing functions and processes. Instead of instilling a new structure outside of the existing organizational structure, incremental transformation attempts to control the existing planning mechanisms to implement the change. Typically, this means that the program goals are translated into strategic drivers and metrics which are then injected into the annual/quarterly planning processes of the different subunits of the organization. This requires that these subunits employ some level of formal planning in selecting project portfolios – and that these methods are subject to some level of influence by the transformation program leadership. Now we arrive at the original premise of this post. What are the funding model implications of these two approaches? This is actually a perennial question that many organizations struggle with. As always, the decision for how to architect the funding model lies on control. If the program requires firm control and visibility into progress as in the step change model, funding should be through a central program entity. If the program is less urgent in time, and is dependent on gradually shaping the direction of the organization, a deferred funding model is probably appropriate. That being said, the more sophisticated organizations that I work with still have a portfolio coding mechanism to flag wholly or in part how much of the investment in a particular project is supporting the transformation initiative. The two approaches also imply a separate supporting technology architecture. In a step change model, attention must be paid to the structuring of the work portfolio, the decomposition of the overall program into its component parts, and the required blocking and tackling for each of those parts: budgeting, scheduling (deterministic or agile), risk management, schedule integration, etc. Each of those parts must then be mapped to the overall context of programmatic risk management and governance. These processes require appropriate technology support, i.e. a mechanism to structure and support the overall governance of the program. 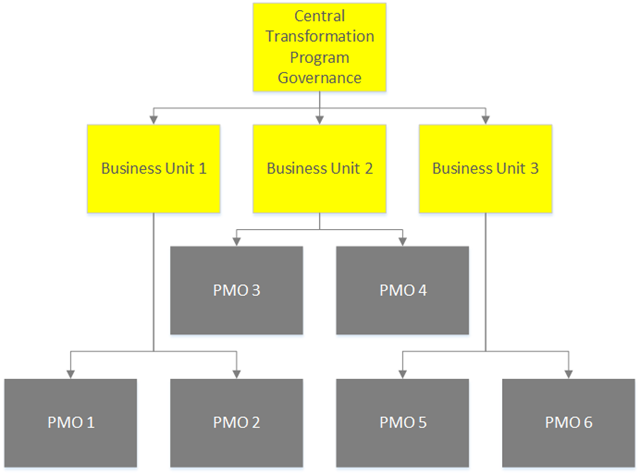 Incremental change is typically more dependent on a federated PMO model. Organizations usually maintain multiple planning organizations by function and/or business unit. These organizations are responsible for selecting the appropriate mix of projects for the organization – and in turn, their specific spending authority is subject to a number of factors such as how nimble the organization needs to be, economic factors, etc. (see an older discussion here). The critical consideration here is that to support the overall needs of the long term incremental change, leadership needs a way of influencing the behavior of the specific units within the organization, and that is most often performed through pulling the levers of the project selection mechanism. Hence, if each unit within the organization has a centralized function to perform portfolio planning, and the factors that impact the planning are capable of being influenced from the central organization, the entire ship may be steered in an appropriate direction. In the incremental change model, attention should be spent on ensuring the appropriate technology is in place to support visibility into the pipeline of projects passing through each of the various planning entities – and to ensure that project approval decisions are made according to the appropriate drivers. In this case, the technology is focused on making the approval decision making process transparent and consistent. The reality though is that the question of step change or incremental transformation is not an either…or… decision but an either…and… decision. I typically see organizations leverage a step change opportunity to implement the technical and process infrastructure required to support the long term adoption of an incremental change culture. Hence the processes that get created to support the step change transformation get baked into the organization and reinforce long term behavioral change and performance improvement. This approach also serves to reinforce the value proposition that the original transformation was designed to bring about in the first place. ← Under What Conditions do PMOs Naturally Emerge? Good feedback. In that situation, the issue could be avoided by treating BAU as a separate portfolio budgeted at the program/asset level. Work would be approved by the asset manager – which would accelerate the approval cycle but still be subject to prioritization (in the form of an asset based budget).